As I ride home from work in the evenings, an intersection in downtown Brooklyn often prompts me to ponder New York City’s attitude to cycling. The southbound bike lane on Smith St at Fulton St used to move out gracefully round a waiting area for taxis and car-service vehicles. Then, recognising that the lane was constantly blocked by parked vehicles, the city decided to repaint the lane so that the parked taxis would no longer block it – though cyclists would have to perform a dangerous swerve out into traffic to round the parked vehicles. More recently, it’s been repainted yet again – and the lane’s now back to guiding cyclists smoothly through the junction – and once again perpetually blocked. of the city's vacillation about cyclists. The intersection is a beautiful concrete – or asphalt – illustration of New York City’s equivocal attitude towards encouraging cycling. The city has been prepared to paint bicycle lanes on streets – although it’s now retreating even from that in favour of the dreadful “extra-wide parking lane”. But the city has been far less ready – particularly since Janette Sadik-Khan left as transport commissioner at the end of 2013 – to recognise that to accommodate cyclists well in a given road space it is also often necessary to inconvenience motorists. There has lately seemed to be a waning of the confidence under Michael Bloomberg, the previous mayor, that by promoting cycling the city was making progress towards being a better city. A bike ride last Thursday prompted me to ponder further the politics of this change. I rode with members of New York city council’s progressive caucus from Brooklyn Borough Hall across the Brooklyn Bridge to City Hall to highlight the importance of cycling. A Manhattan delegation, having ridden from Union Square, met us at City Hall. 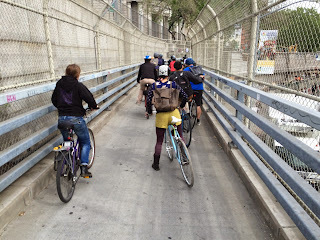 As I rode with Brad Lander, Carlos Menchaca and other left-leaning individuals, I got into discussion about the “progressive” agenda for transport in the city and how intimately cycling is linked to making the city better for all its inhabitants. Hall: a reliable progressive enthusiast for cycling. I came away convinced that there are many progressive politicians in the city who recognise that the way people get about significantly affects how equitable and safe a city is for all its inhabitants. But I also left worried that some other progressive politicians fail to grasp what a big role changes to those patterns of mobility could play in achieving their wider goals. Even the term progress is a pretty significant stumbling-block when thinking about these issues. The term implies that humans are learning from previous generations’ mistakes to make the world a steadily better place. It’s a view of the world that sits uncomfortably with the multiple areas where the world appears to be going into reverse. Among those are the rise of vicious Islamist radicals like the Islamic State and the takeover of the US’s Republican Party by groups that appear to reject the reliability of the scientific method for deducing facts about the world. The term also calls into question what “progress” is. Does it entail everyone’s growing steadily richer and buying ever more cars and consumer goods? At its worst, the goal of pushing towards “progress” has justified appalling acts of political repression. Nevertheless, I’m confident that in most industrialised societies people’s political instincts divide fairly neatly into conservative and progressive camps. Conservatives tend to believe the past was better than the present and that society’s existing power structures are there for fairly good reasons. Progressives tend to think the future can be better than the present and question the power structures currently in place. but it's a fair guess many would call themselves progressives. It’s no surprise that many cycling activists, as I do, place themselves broadly in the progressive political camp. Since cycling currently accounts for only a small proportion of journeys in many rich countries, arguments for cycling are by their nature arguments for building a future that’s better than the present. Conservatives such as Boris Johnson, London’s elected mayor, are rarer – but often seem to value the bicycle as a symbol of how things were done in the past. Far more conservatives - including Jeremy Clarkson, formerly of the BBC’s Top Gear franchise – seem to identify with car culture. 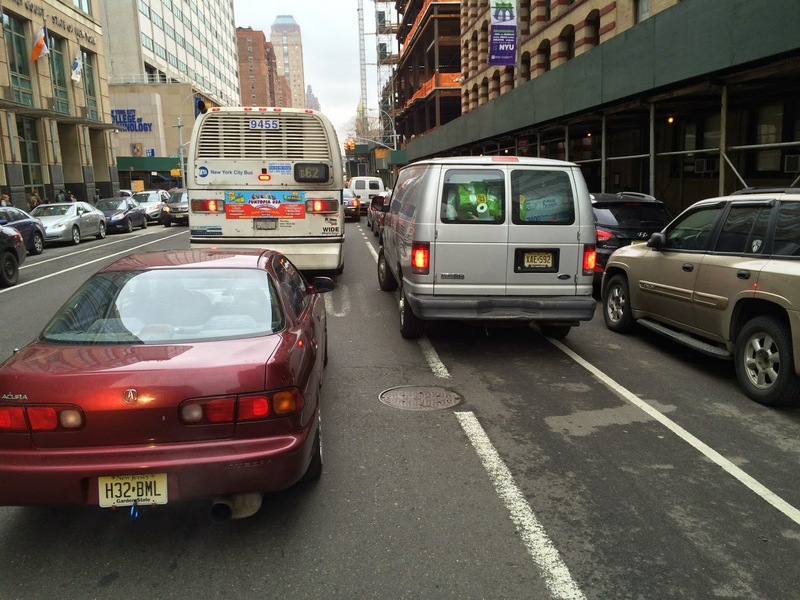 But that point doesn’t fit with recent shifts in attitudes towards cycling in New York. Following the election in late 2013 of Bill de Blasio – a Democratic mayor about as far left as any conceivable mayor of the US’s main financial centre – it’s clear that cycling has moved well down the city’s list of political priorities. Compared with Michael Bloomberg, his far more conservative predecessor, the current mayor seems to see little reason to encourage cycling to work or the completion of the city’s cycling network. In fact, the fading paint on many of the city’s cycle lanes is a neat illustration of how fragile progress in such an area can be. With less active support for cycling promotion, the previous gains are almost literally fading away. It wouldn’t be surprising, in fact, if the mayor were a little distrustful of those of us who lobby for cycling. The mayor fought the election on the basis that he would campaign for the second New York that had been neglected during the Bloomberg years. From the perspective of poor neighbourhoods far out in Brooklyn, Queens and The Bronx, those of us from brownstone Brooklyn and nice parts of Manhattan who lobby for better cycling provision must seem like representatives of the elements in the city that are already well catered-to. It must also make a great deal of sense looked at from poorer neighbourhoods for the mayor to focus much of his transport energy on the Vision Zero programme of reducing road deaths. A disproportionate number of those who die on the roads are people like Noshat Nahian, an eight-year-old child of Bangladeshi immigrants killed by a turning semi-trailer truck on Northern Boulevard in Queens, or Amar Diarrassouba, the six-year-old son of immigrants from Cote d’Ivoire killed by a truck in February 2013 as he walked to school in East Harlem. There’s no doubt that trucks and cars – which predominantly support the lifestyles of New York’s richer people – exact a disproportionate toll in death and injury on poorer New Yorkers. The mayor is quite right to try to address that. Yet it’s a significant failure of imagination not to try to do more than that. 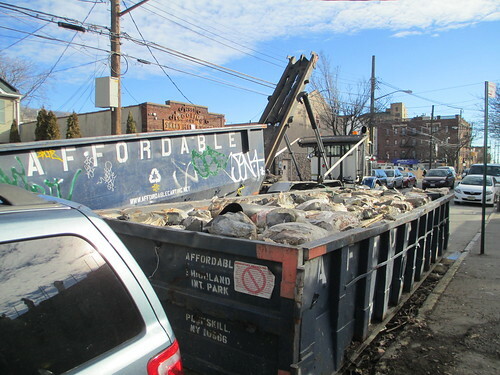 Because New York state’s gas tax and other fees for driving cover only 56.1 per cent of the cost of providing the state’s road system, poor state taxpayers without cars are forced to pay much of the cost of maintaining the road system. That’s even before considering all the other costs that the road system imposes – the costs of crashes, congestion, atmospheric pollution and noise, all of which are shouldered by ordinary taxpayers. 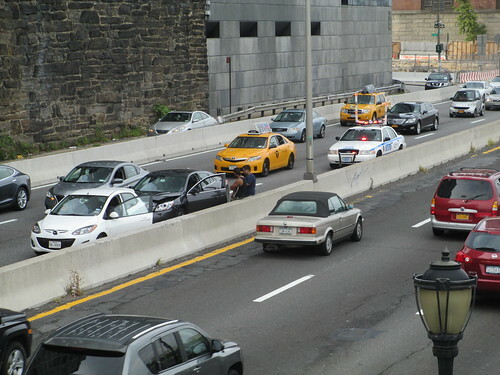 Any effort to make New York City less car-dependent is inevitably a progressive step away from the regressive effects of the current system of funding for roads. It would also make perfect sense for a progressive mayor to support Move New York’s sensible plans to charge all vehicles entering lower Manhattan a fee that would be used to support the city’s subways and other alternative means of transport. The higher charges would fall predominantly on the city’s wealthiest people, while a great many of the benefits would flow to the city’s poor. to keep riding their bikes. An increase in the number of people cycling would serve many of the political goals for which the mayor and many other progressives purport to be aiming. It would reduce the cost burden of maintaining the road system, reduce pollution – another ill that disproportionately harms the poor living by arterial roads – and improve New Yorkers’ overall health. Despite some high-profile incidents, it's also far safer for pedestrians to be around people using bicycles than people using cars. 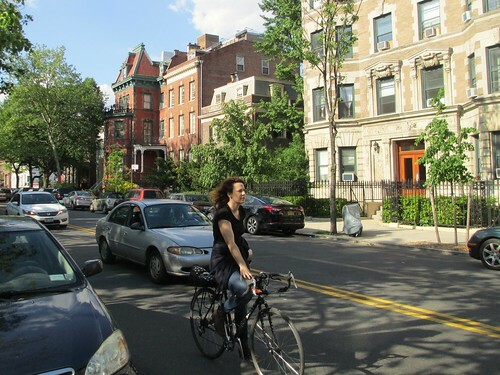 There is no good reason either why, with better cycle provision, people in some of New York’s more central public housing projects should not take to cycling far more than at present. Yet the scene at the corner of Smith and Fulton illustrates the challenge. The Department of Transportation was prevailed upon to change the bike lane arrangement at the corner in the interests of preserving a single parking space. The city’s willingness to get people cycling has melted in the face of a backlash by those who see parking spaces as their own private property. There could scarcely be a more reactionary force than groups determined to preserve the right to store their private luxury items on-street for free, but their indignation seems for now to have intimidated many progressive forces into leaving parking spaces well alone. Vested interests can also push the apparently progressive side towards reactionary stances. 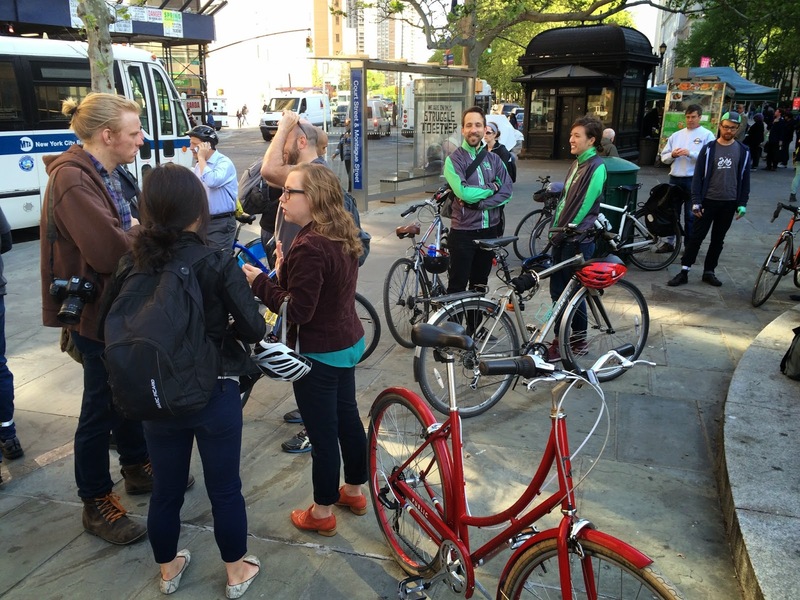 Both Ben Kallos and Robert Cornegy, council members who turned up at last weeks’ cycling event, have backed a bill supported by transport workers exempting them from legal penalties if they hit pedestrians and cyclists who have the right of way. Such equivocation about improving conditions for cycling explains a great deal of what the ride from Brooklyn Borough Hall experienced on the first section of our ride to the Brooklyn Bridge. We left the Borough Hall by way of Jay St and found ourselves jostling among heavy traffic, including at least one double-parked car in the bicycle lane. It wasn’t hard to see, taking in the scene, why only 1 per cent of New Yorkers’ commuting trips are currently by bicycle. New York and many other cities would be a better, fairer place if more of its citizens were getting about by bicycle. Increasing the share of journeys made by bicycle should, consequently, be part of the progressive agenda alongside more obvious causes such as improving urban education and housing. But, if progressives continue to lack political courage when tackling car-dependency or conservatives stay entrenched in power, it’s hard to imagine conditions improving dramatically in the immediate future. The young man looked at me distrustfully. I gestured to him to head across the pedestrian crossing where I’d stopped my bike for him. He again looked warily to his left, in the direction from which cars tear at high speed down Hoyt Street, in Cobble Hill, in defiance of the area’s 20mph speed limit. Having finally decided that it was safe, he crossed and I was able to resume my journey. 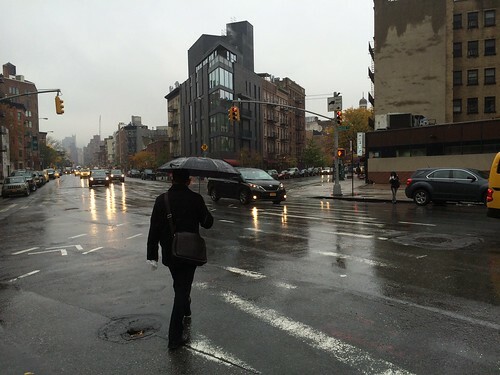 A New York City pedestrian: understandably wary. The incident on Friday night was one of the clearest illustrations I’ve encountered recently of the difficulty of communicating with other road users. Such communications are often obstructed by noise, by the challenges of communicating with people inside a metal box and by people’s varying expectations about how other road users will behave. 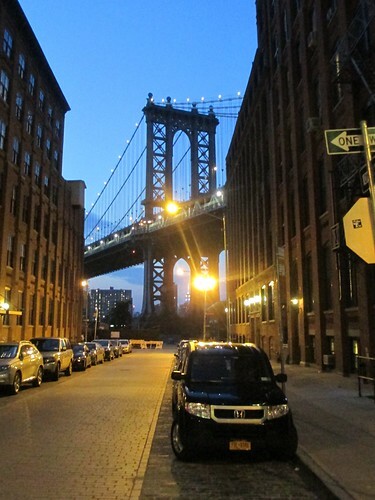 The young man I encountered was fearful of my effort to help him cross the road precisely because no-one else stops for that crosswalk, which links shops on Hoyt St to the Gowanus Houses public housing on the other side of the road. My stopping was so out of step with other road users’ behaviour that it must have seemed like some kind of practical joke. The communication barrier facing cyclists seems particuarly high in cities like New York and London where cars dominate the streetscape. In such big, industrialised cities with only modest cycling levels, few other road users have the inbuilt sense of how cyclists might or should behave that they have with motorists and pedestrians. The scope for severe mutual misunderstanding is significant. Yet roads remain intensely communal places, where the different users are entirely reliant on each other for safety. Cyclists, drivers and pedestrians all need to decode a complex series of verbal and non-verbal signals to work out each others’ intentions and likely future behaviour. The communication barriers play a big part in ensuring that roads remain such dangerous places. But almost no-one addresses the obstacles that the obvious and growing barriers represent. have to practise my new communication policy with drivers. My sensitivity to the challenges of interacting with other road users has been heightened, I suspect, by a change in my own communication policy. In the last few months, I’ve become even more prone than before to using my loud, powerful voice to try to stop drivers from running me over. I do this most often by shouting at drivers trying to cut across my path at intersections, “Stop! Wait there!” While I’m sure that many of those at whom I shout have no desire to behave legally and respect my right of way, most drivers who hear someone shout, “Stop!” loudly in their direction seem to step at least temporarily on the brake pedal. But I’ve also been struck by the policy’s shortcomings. It regularly leads passersby to shout mockingly at me, rather as though vocal communications in traffic were subject to the same taboos as speaking in a library or an ancient sacred space. People seem to resent clear, unambiguous communication across the cyclist-driver divide. starts pulling out in front of your bike. My shouts also seem to work far less well with drivers who are pulling out of parking spaces into my path. There’s a tendency for drivers creeping slowly into a bike lane while waiting for a suitable gap to pull out to believe their intentions should be clear to those around them. When I shout, “Stop!” at such a driver moving slowly into my path, his or her rejoinder is often to shout, “I saw you!” There’s a failure on the driver’s part to understand that his or her actions communicate the intention to pull out but not that he or she has seen me and is taking care not to hit me. It’s because I recognise that my actions are my clearest means of communicating with fellow road-users that I seek, by and large, to obey traffic signals. I hope – and I realise it’s a fairly forlorn hope – that the example of my self-discipline will communicate itself to the drivers who pose the real danger. I think there’s a usefulness to having an agreed set of standards for how to act on the roads – albeit a severely flawed one – and to making a point of obeying it. For the same reason, I try as I cycle around to make obvious, unambiguous movements. When passing a car parked in a bike lane, I don’t squeeze by hoping that other vehicles won’t pass me too close. I swing firmly out into the neighbouring traffic lane, showing following motorists that they shouldn’t overtake. I try to make eye contact with drivers when I can. I signal clearly where I’m going. I use my bell to warn pedestrians when I’m approaching – although, frankly, a follow-up shout of “Watch out in the crosswalk!” to people crossing against the light is generally necessary. Many of these efforts nevertheless run slap-bang into vast barriers. Some of them are cultural. 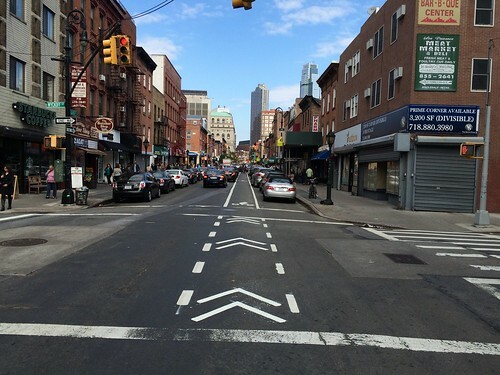 New York drivers seem so used to the idea that they can pass a cyclist in a bike lane with only a tiny space to spare that it barely seems worth trying to communicate with those who do why their behaviour is so dangerous. I ran into similar challenges when I lived in London with drivers who simply didn't seem to realise they shouldn't block advance stop boxes at traffic lights. The most inescapable fact of on-road communication, meanwhile, is that the modern motor vehicle is designed to shield users from the reality of their being involved in a social interaction. The interior of a motor car looks and feels more like someone’s home than a machine for transporting goods and people. Cadillac last year ran an advertising campaign showing a ring of cymbal-clanging toy monkeys surrounding a Cadillac CTS expressly to boast how the vehicle’s sound-proofing, glass and even noise-cancelling equipment would silence the reality outside the vehicle. It’s no surprise that people riding in such vehicles might struggle to grasp the complexity of what’s going on in the streets surrounding them – or that they might react angrily to my rapping on the window to point out that they’ve nearly, by their negligence, run me off the road. Inside that sensation-deprived space, there must be a heightened sense of frustration at the mismatch between the calm sounds of the vehicle’s clear stereo or white noise and the more chaotic pictures coming in through the windows. I’m confident that frustration explains many of the times I have motorists drive fast at me, blaring their horns. This silent, frantically pedalling cyclist must seem like a disorderly intrusion compared with the orderly sound world of the vehicle’s interior. All of these obstacles play a part in keeping New York's road safety record poor, despite the current mayor's Vision Zero efforts. The position would, needless to say, grow easier if the city built more infrastructure to reduce conflicts, including more of a network of well-designed protected cycle paths. sound-proofed to ensure he can ignore the other. As it stands, people find themselves caught up in conflicts fuelled by misunderstanding - and seized of a powerful impulse to reach through the barriers and explain why they're frustrated. I saw it vividly one recent morning when a woman, wrapped up in her car’s smooth inner world, pulled out of a side street in front of a cyclist careering down Smith St on a single speed. The cyclist jammed on his brakes and landed in a heap. His immediate instinct was to spring to his feet and aim a defiant one-fingered salute towards the rear-view mirror of the motorist. I suspect she never had any inkling of the harm she had done. 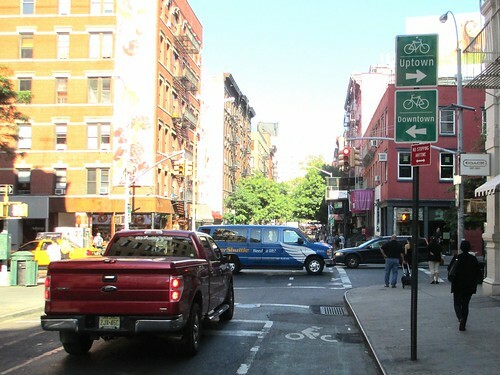 I was caught up in a more complicated instance last Thursday when cycling home down Grand St in SoHo. A man in front of me was pushing a baby buggy (stroller, American readers) down the narrow bike lane, one child inside the stroller and another riding on the rear. His only reaction to my bell-ringing was to continue an exaggerated saunter, taking obvious pleasure in blocking my way. I started calmly, pointing out that it was irresponsible of him to block a busy bike lane and that someone could have hit him. It would have been irresponsible of me to hit him, he replied, so I was the irresponsible one. His deliberate, bullying contempt mixed in with my tiredness after a red-eye flight the night before and my dismay at the emerging British general election results. I felt the urge to communicate quite how deeply he had offended me. I pointed out – accurately, I think – that he was setting a poor example to his children. I pointed out – again accurately – that his behaviour was making his wife slink away in embarrassment. I finished with a piece of more metaphysical speculation. “Your soul’s shrivelling inside you because you’re so petty,” I shouted as I rode away. I should not, clearly, have allowed myself to be provoked. But humans feel the need to connect and communicate with those around them. Far too many street and vehicle designs hinder, rather than work with, humans’ need to talk to each other. It feels like no exaggeration to say that's drying up many cities' souls.